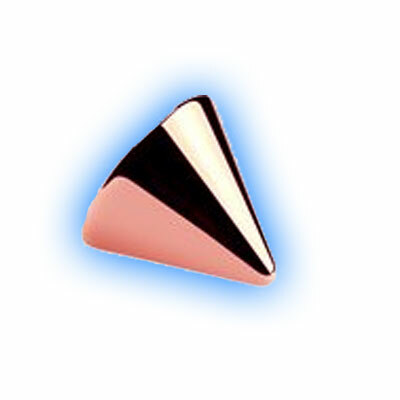 The Rose Gold plated cones are suitable for 1.2mm (16 gauge) externally threaded body piercing jewellery and are available in either 3mm or 4mm. They look stunning in eyebrow bars, twisters or 16g labret studs in Monroe, facial or ear piercings. The 18k Rose Gold Plating is applied here in the UK onto 316L Surgical steel and then hand polished to give a lovely shiny finish.